Flinders Ocean Beach starring MowBro, G-Man, Coop Dogg & Hardman (L-R). Strangely there was only 1 beard out of 5 sea kayakers. Bretto is no stranger to a solo adventure – but it’s always more fun to get out there with some like minded mates for a bit of fun. 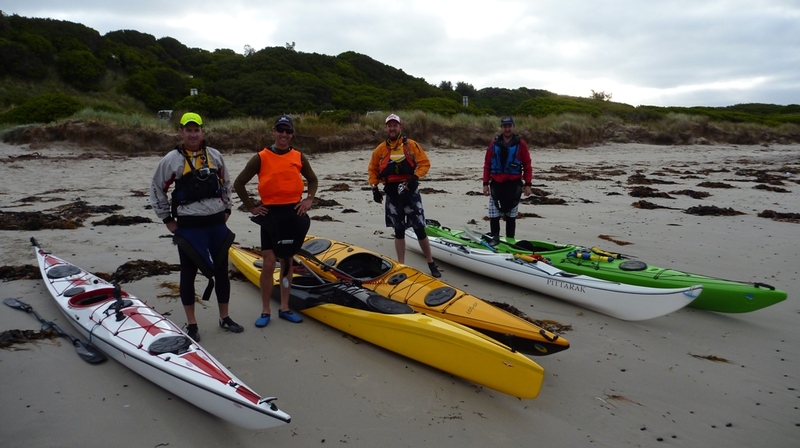 We hit the water at 0630 this morning and decided to launch from the Mushroom Reef Marine Sanctuary (access via Flinders Golf Course). Conditions were great with a 5-10 knot wind and gentle swell rolling in from the SW. After we had negotiated our way through a gap in the reef and the breaking waves – we headed west towards Cape Schanck. The mild conditions provided a great opportunity to practice some deep water re-entries and self rescues. Coop Dogg’s Pittarak is mighty ugly and rolls like a greasy refrigerator – but for $100 it was the sea kayak bargain of the year. There was a few cases of mild seasickness in the group (Bretto included) so after a few hours cruising around we weaved our way back through the reef and landed safely at the beach.